An easy-to-use, highly-maneuverable drive system is at the heart of a successful FIRST Robotics Challenge (FRC) robot. Omnidirectional drive systems provide motion in the Y axis (forward-backward), X-axis (strafe), and Z axis (rotating about it’s center axis). Each “degree of freedom” is independent, meaning that the overall robot motion is comprised of a “mix” of motion in each of the X, Y and Z axes, control of which is easily provided with a 3-degree of freedom joystick. This resulting maneuverability is quite useful during FRC competitions to avoid other robots, pick up and place game pieces, line up for shooting to a target, etc. The WPI Library “MecanumDrive_Cartesian()” function and the LabView “Holonomic Drive” VI, which are used in the examples below, implement the field-centric drive algorithm. The navX-MXP “Yaw” angle is provided to these library functions to specify the amount of rotation between the robot and the field. 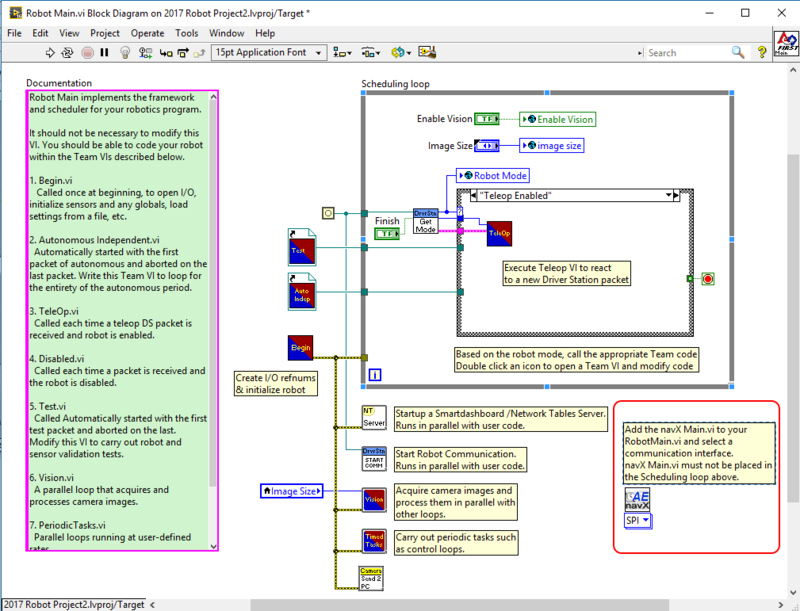 For more details on field-centric drive algorithms, please see this excellent post on Chief Delphi by Ether which provides a wealth of helpful, well written information on implementing field-centric drive on various types of drive systems. 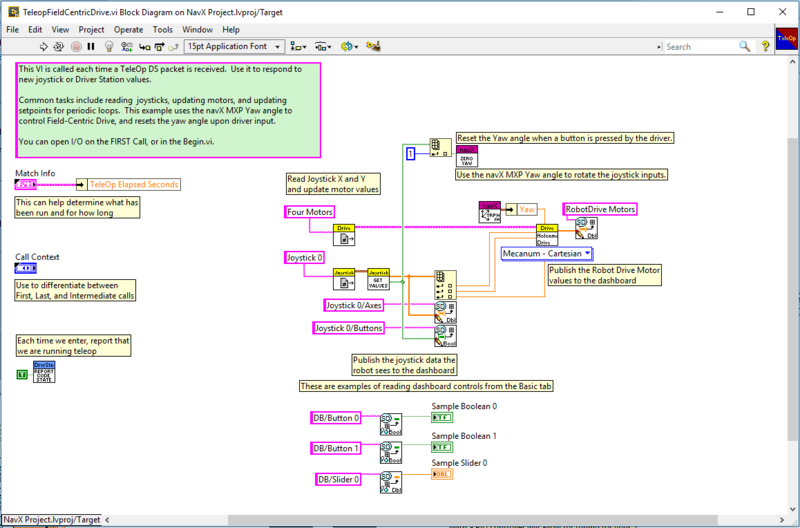 The navX-MXP FieldCentric-Drive LabView example shows how to make small modifications to the LabView “FRC RoboRIO Robot Project” using the “Mecanum Robot” configuration to implement high-accuracy Field-Centric drive. The Teleop.vi is modified to feed the current navX-MXP “Yaw” angle reading to the Holonomic Drive VI, which rotates the joystick X/Y coordinates by the gyro angle (and thus implements FieldCentric drive control). Additionally, if a driver joystick button is pressed, the navX-MXP “Yaw” angle is reset to zero. The navX-MXP Device TypeDef is passed to the Teleop.vi via a VI input terminal.